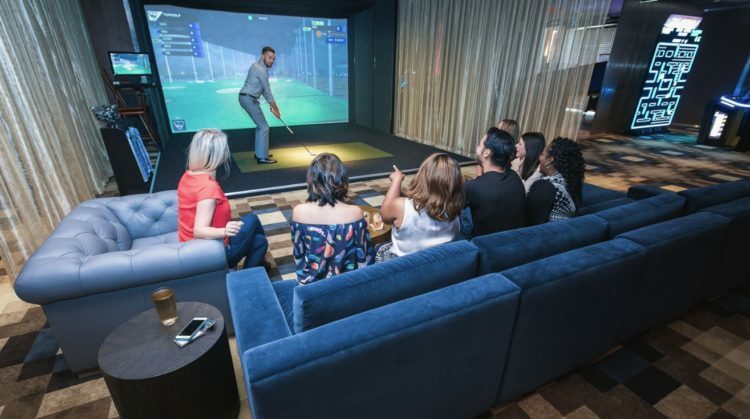 Debuting September 1 at M Resort Spa Casino, the new Topgolf Swing Suite will elevate the traditional bay experience to an even more luxurious level — what else would you expect in Vegas? The two-bay suite will take the traditional Topgolf experience up a notch by providing a full temperature-controlled luxury suite with lounge seating and a one-of-a-kind simulated experience. The Swing Suite will be ideal for date nights, celebrations, family get-togethers or those looking to simply work on their swing. Guests can enjoy various golf and multi-sport games like the TopContender, modeled after Topgolf’s signature game, which tracks shot accuracy while awarding players points for hitting targets. They also have the option to take the mound and pitch against a team of zombies or test their skills by playing some of the world’s best golf courses, such as St. Andrews, Gleneagles, Torrey Pines, Pebble Beach and more. Located across from Baby Cakes Artisan Bakery, guests can order up delicious eats like burgers, pizza, craft beer, specialty cocktails and gourmet milkshakes. The Topgolf Swing Suite starts at $30. Opens 10 a.m. Mon-Fri, 9 a.m. Sat. and Sun. Closes 10 p.m. Sun-Thurs, 11 p.m. Fri. and Sat.